You have been planning all those details, table linens, flowers, favors and more, now it's time to think about the wedding ceremony. Every ceremony is different and this is no way written to suggest that you should do your wedding ceremony in this order. However, below you will find a basic format to help you in your planning. The Prelude: This is the pre-game show. Your guest are arriving and enjoying music - plan at least for 20 minutes worth. At this time your guest are also signing the guest book and mingling while looking over the programs. The Procession: Time for the wedding party to make an entrance. This can included the seating of the grandparents, and parents before the bridal party. The last song should be for the Bride to have her grand entrance. Opening Remarks: This includes usually a welcome or prayer, something from the officiant. 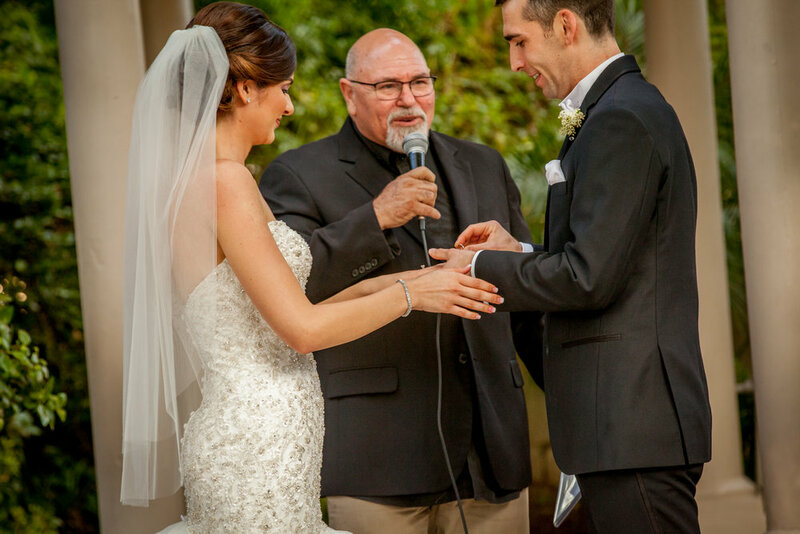 The Exchange of Vows: If you decide to write your own or repeat vows prepare in advance with the officiant. the most important part is to look at each other when YOU'RE say them. Optional Unity Ceremony: During this time you can choose a unity ceremony. This ceremony symbolizes two individuals joining together to make one. Ceremony can be, sand set, rose set, paint, wine, candles and more. This time can also be used for first communion or a couples prayer time. The Pronouncement of Marriage: This the big moment- where you are officially announced as married! The Recessional: You are introduced and now it is time to party! !